Replace the machine when it is old enough that there is an x% probability that it has reached the end of its useful life, based upon statistics for all users of the same machine and the passage of time. Replace the machine when it has been used so much that it has reached an x% probability of failure, based upon statistics for all users of the same machine and the actual usage you make of the machine. Repair the machine when one of dozens of sensors placed within the machine indicates that some part of the machine is starting to operate outside of desired specs. Replace the machine when such repairs are not cost effective. No risk management program – let the losses happen and mop up afterward. Manage to some broad industry standard, like premium to surplus ratio or assets to surplus ratio. Manage to some risk adjusted industry standard like BCAR or RBC. Manage to a detailed and carefully updated comprehensive risk model. Of course, 4 is the most expensive course, for both the “real” companies and the financial firms. Which course you pick depends upon how devastating an event it is for your machine to break down unexpectedly. If your business can stand a few days/weeks/months without the machine, then maybe the very low cost path 1 is fine for you. For financial firms, the question is the cost of an unexpected and large excess loss. How disruptive will it be to have to either curtail business activity until you are able to build back capital or to raise the capital to replace what you lost with new capital? Can you keep doing business while you settle that question? What is the opportunity cost of not being able to write business right after a big loss? The analogy is a pretty good fit. Feel free to use it when you have to argue for more risk management spend. These four paths happen to coincide exactly with the four views of risk from Plural Rationalities. The Maximizer will be sure that we can just Grow Out of It if the government will just get out of the way and let the market work its magic. The Managers will believe that a careful process of gradual inflation will bring the economy back into line with the debt. This process will work if the expert government economists who really understand the problem are given their freedom to manage this. In the meantime, they will also want to increase the laws and regulations so that this sort of thing will not happen again. The Conservators believe that since default is inevitable, then we might as well take our lumps and get it out of the way quickly. They will not be convinced, even after the default that anything has been completely solved and will continue to worry that there is more bad news just around the corner. So they will be preparing for the next shoe to drop. They will probably favor cutting spending to make sure that things come back into balance. The Pragmatist will believe that there is not really a good way out and that the economy will be stuck in this stage of uncertainty for an extended period. They may even believe that the efforts of the others to try to solve the problems might extend that uncertain period even longer. Looking back on the 1930’s we see that in various countries at various times during that decade that all four paths were tried by various governments. What worked then? Well, you can find that there are four different opinions on what was the exact reason that we came out of the depression…..
New movie about 24 hours in the life of a troubled bank at the height of the financial crisis, Margin Call. Read a review from the point of view of a risk manager here. The name calling involved is a distraction from the real problem – the problem of how to keep our entire economic system working with the massive shifting of people into the non-productive retirement ages. Besides the imbalances in pay as you go programs like social security and medicare, there is the problem of who is going to buy the securities that the retirees will need to sell to pay for living expenses? What usually happens when the market knows that someone MUST sell something? What percentage of the stock market’s total holdings MUST be sold over the next 30 years? Everyone keeps pretending that this is some sort of marginal change situation. It is definitely not. What happens if the Boomers sell off causes the market to drop by another 25 – 30%? The solid line represents the ratio of middle aged people (40 – 49) to Old Agers (60 – 69). This picture shows a 30% drop in PE. If earnings are also challenged by the low or negative population growth during the same time period, the massive drop is stock prices is quite possible. So even the people who did save for retirement may be woefully surprised that their money does not save them. The stock market is but a large and often somewhated distorted mirror of the economy. If the stock market is challenged by the low growth of the population and the shift from production to consumption of the large retiree population, then that is a reflection that the economy could be challenged in just the same manner. That is the REALLY BIG problem that needs to be solved. The Social Security problem is not at all difficult to solve. According to the most recent actuarial report to the trustees, the shortfall in Social Security is 14% of projected benefits or 17% of projected revenues. So anyone who can do arithmetic can work out some combination of increases to taxes and decreases to benefits that would bring the program into balance over the 75 year projection period. Split it down the middle and decrease benefits by 7% and increase social security taxes by 8.5% and it is solved. But the fact of the matter is that there is no serious consideration being given to any solution, let alone a straightforward solution like the above that anyone could understand. The Greek citizens – this has been the first place that they wanted to go. But so far the Greeks have shrugged off attempts to get them to even stop running up additional debt, let alone repaying any old debt. Realists are now struggling with trying to determine who else they can find to take the Loser shares. The efforts of the Greek government have all been to slow the rate of new borrowing, and those have fallen short of goals. The non-Greek Europeans – this approach is accomplished through a government to government or government to ECB to government transfer of money. This has been the central approach to date. This approach is limited because of the reluctance of the German people (and therefore their politicians) to take a larger Loser share. Their concern is that the Greek citizens have been the winners (through excessive government spending and salaries) so the Germans who have been frugal and prudent should not be providing a larger share than the Winners. The banks – who all somehow managed to own greater or lesser amounts of Greek debt. Unfortunately, these banks are mostly European. And if forced to bare the bulk of the losses might find themselves in need of government bailouts. Back to the non-Greek Europeans. But it is worthwhile to think for a minute what making the banks taking a large Loser share would involve. If the banks take a large Loser share, they have to decide who among six parties will they then spread the share to. Those parties are: bondholders, stockholders, management, employees, customers and other counterparties. Non- Europeans – enter the IMF which has made smaller contributions to this situation than the Europenas, but not insignificant contributions. The involvement of the IMF creates interesting precedents for future situations. The Greeks are proving that there is no reason whatsoever to ever comply with international financial covenants. The IMF was famous for imposing draconian requirements on those to whom it lends. But that story is being rewritten by the Europeans. To some it appears that there are two sets of rules when it comes to loans from the IMF. And where you live determines which set of rules apply. So back to the negotiating table. History of the past 10 years has shown that the Greek government will agree to any terms, but will have trouble delivering on anything. Countries have not recently tried living without banks. But most assume that would be fairly difficult. So in the end, the European people will pick up the tab. It seems makes sense to settle this sooner rather than later so that it will be possible to put a stop to further Greek overspending. But that sensible concern does not seem to be moving the leaders to doing the difficult work of assigning the Loser shares. Clearly, there was not any realistic discussion of this possible situation BEFORE the crisis. The Greeks promised repeatedly not to ever get close to this sort of mess. The banks have rules against lending to entities who are not likely to repay and they have regulators whose job it is to make sure that they do not get in over their head. Governments presumed, perhaps without any basis in reality, to believe that those three lines of defense would be more than enough. The response ultimately needs to be something other than adding two more nevers to the promise to never, never, never, never let this happen again. An actuary from one insurer often tells the story that his firm will always want to understand how a new product might fail before they agree to start selling that product. Perhaps that is what is needed for countries and their banking systems. They need to think through how things might break and say in advance who will bare the Loser shares. In really having that discussion, perhaps it will become clear that it is much easier to distribute losses when they are smaller and that their main task needs to be to identify and deal with Loser shares when they are smaller rather than the recent strategy of hoping that they would go away. Some might suggest that there are a set of rules in place for that. But the evidence is clear that those rules are insufficient. We all need to get realistic about these situations and develop a new set of rules that might carry us for another 50+ years. Rather than solutions that work for a few months. Does Your Firm Know What To Do At a Yellow Light? The Yellow light was invented in 1920. Almost 100 years later. 85% of drivers have no idea what to do when they see one. A risk management system needs yellow lights. Signals that automatically tell people to “Proceed with Caution”. These signals need to be sensitive to both outside changes in the risk environment and to inside decisions about risk. A good risk management program needs to have a system that looks for the conditions that mean that it is hurricane season for each of the major risks. And it needs to have plans for what needs to to done in each part of the firm so that they “Proceed with Caution”. And the managers of the affected areas need to know those plans and their own roles. And there needs to be a Yellow (or Amber) light that flashes somewhere. And then the managers need to act, they need to execute the plans to Proceed with Caution. The same thing applies to the other reason that might trigger a yellow light. That would be company actions. Most firms have risk limits. Some of those risk limits are “soft” limits. That means that the limit itself is a Yellow Light. Hitting the limit in these firms means that you must “Proceed with Caution”. More commonly, the limits are HARD; either Red Lights, Cement Barriers or Brick Walls. A red Light risk limit, means that when you get to the limit, you must stop and wait for someone to tell you that you can proceed. A cement barrier risk limit means that you are prohibited from proceeding when you hit a limit. A brick wall risk limits means that if you hit the limit, you are likely to be terminated. In these three sorts of control systems, there are often informal Yellow Lights and occasionally formal caution signals. 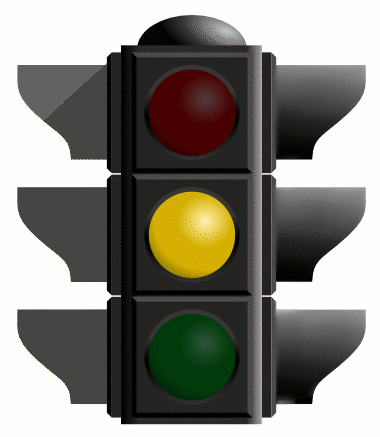 RISKVIEWS suggests that all firms that use HARD limits should create a formal Yellow Light system with a process that identifies an official Caution point along with suggestions or rules or plans of how to proceed when the Yellow Light goes on. On the highway, Yellow Lights cause problems because there are really three different understandings. One group believes that it means “Speed Up to avoid the Red Light”, while another group thinks it means “Stop now and Avoid having to make an Emergency Stop when the Red Light comes on”. “watch out for the other two groups“.